Our portfolio of print and apply systems provide the best combination of features and capabilities for the demanding requirements of today’s applications. 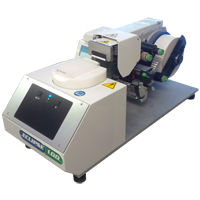 The LC100i Applicator is an ‘on demand’ print & apply system with high resolution (600 dpi) thermal transfer printing and is ideal for precision labeling requirements with an emphasis on small labels and ‘zero queue’ printing. The LC100i includes our LabelBot intelligent electric tamping system. 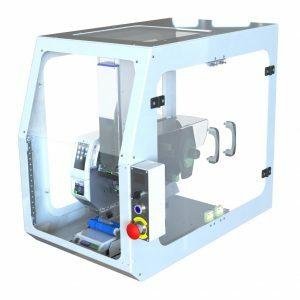 Our PL100-TTP and PL165-TTP provide all of the features and versatility of our PL Series Applicators with the addition of thermal transfer printing. For these models the printer can be provided with 300 or 600 dpi and with printers of various width capacities. The Tube Pro products are configured specifically for reliable and precise application of labels to tubes, vials, and other cylindrical labware and the Eclipse series of Plate Labelers are configured specifically to print and apply labels to micro well plates. The LC100i is a highly advanced Print & Apply system specifically designed for challenging labeling requirements. High resolution thermal transfer print quality combined with Nautilus Systems unique retracting peel technology provides a fantastic solution for any label application. For more information about the LC100i CLICK HERE. The LC100r is the ‘robot mode’ version of our LC100 print and apply systems. The LC100r is a highly advanced ‘print and peel’ system designed for challenging labeling requirements. High resolution (600 dots per inch) thermal transfer print quality combined with NSI’s retracting peel technology provides an excellent solution for any label application. For more information about the LC100r CLICK HERE. 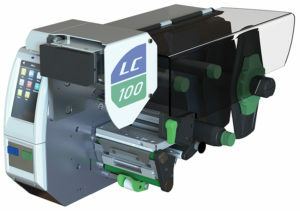 The LC100RT90 is a version of the LC100 series print and apply systems that incorporates a 90 degree rotation of the tamp actuator. 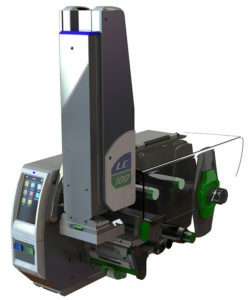 This 90 degree rotation allows the LC100RT90 Applicator to pick the label from a horizontal plane and place it on a vertical plane. For more information about the LC100RT90 CLICK HERE. The PL100-TTP and PL165-TTP provide an excellent package for precision print and apply applications. 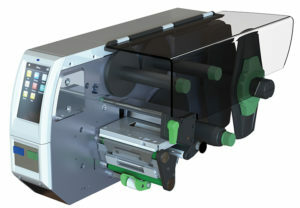 Either a PL100 or a PL165 Applicator, based on the width of the label material, can be configured with a Thermal Transfer Printer (TTP) unit to provide an integrated print and apply system. For more information about the PL100-TTP and PL165-TTP CLICK HERE. 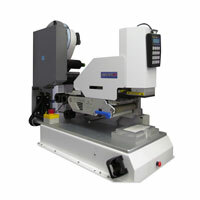 The Eclipse 100 is our most basic print and apply Plate Labeling System. 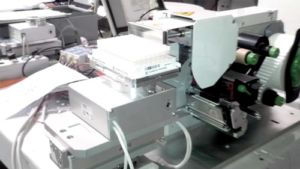 This system was developed to meet needs in the laboratory automation market. 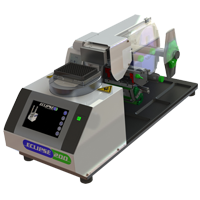 The Eclipse100 is based on our LC100RT90 Applicator and a stationary nest system that allows the user to manually load plates and apply labels to those plates in up to four positions (centered on each side of an SBS footprint plate. Nautilus Systems, Inc. has developed a ‘Syringe Pro’ product line specific to applying and wrapping labels on Syringes. The Syringe Pro is a modular system configured specifically for syringe labeling with options to automatically position Syringes for correct label radial orientation as well as axial location. The radial orientation correction system ensures that the label starts and ends its wrap around the Syringe in the correct position relative to features such as finger flanges. Axial location, which is along the length of the Syringe, is controlled by the design of the Syringe Pro roller set. 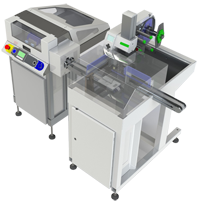 The Syringe Pro is designed for quick changeover between different syringe types and includes modules for printing (thermal transfer or full color), automatic radial orientation, and other functions such as inspection of labels prior to wrapping them on the syringe. For more information about the Syringe Labeling Automation CLICK HERE. The PR100i is a highly advanced Print & Apply system specifically designed for challenging labeling requirements. High resolution thermal transfer print quality combined with Nautilus Systems unique retracting peel technology provides a fantastic solution for any label application. 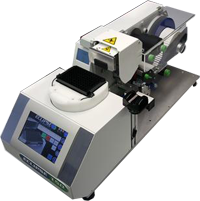 The PR100i is ideal for small labels, high accuracy requirements, and high resolution printing requirements in various markets including Medical Device, Laboratory, Pharmaceutical, Automotive, Packaging, Electronics, and more. The PR100r is the ‘robot mode’ version of our PR100 print and apply systems. The PR100r is a highly advanced ‘print and peel’ system designed for challenging labeling requirements. High resolution (600 dots per inch) thermal transfer print quality combined with NSI’s retracting peel technology provides an excellent solution for any label application. 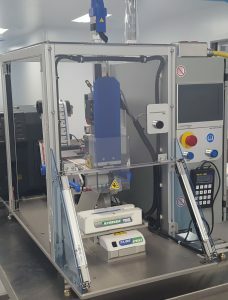 The PR100r is intended for applications that the customer will implement their own robotic pick and place system to interface with the precision ‘print and peel’ operations of the PR100r unit. 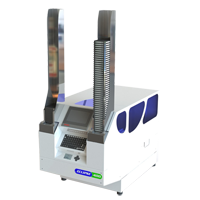 The PR100r is ideal for small labels, high accuracy requirements, and high resolution printing requirements in various markets including Medical Device, Laboratory, Pharmaceutical, Automotive, Packaging, Electronics, and more. The PR100RT90 is a version of the PR100 series print and apply systems that incorporates a 90 degree rotation of the tamp actuator. 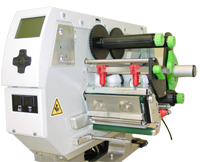 This 90 degree rotation allows the PR100RT90 Applicator to pick the label from a horizontal plane and place it on a vertical plane. 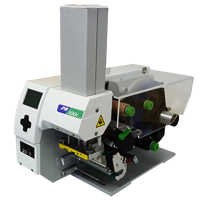 The PR100RT90 was initially developed for our lab automation products specifically for Microwell Plate labeling but is also available as a standalone unit for applications that can take advantage of the rotating tamp configuration. The PR100RT90 is ideal for small labels, high accuracy requirements, and high resolution printing requirements in various markets including Medical Device, Laboratory, Pharmaceutical, Automotive, Packaging, Electronics, and more.